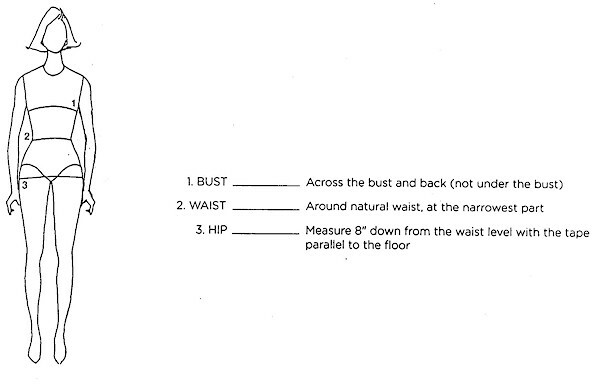 In order to assure the right dress size is chosen we need you to measure your body at the bust, waist, and hips.� See� diagram below� Tell�us your height as well.��Long dresses are a standard 59 inches hollow to hem.This is necessary before the order can be placed.�Most wedding gown returns are for larger sizes because of inaccurate measuring. It's also better to err on the large side to be safe and then have the dress altered to fit. If you are broad shouldered or athletic, work out� or have trouble with�sleeves being too tight �please let us know and go up�1 or 2 sizes. If you are disproportioned� and or plus sized�your bust and waist are the same measurement or very close the dress may not work for you as its made to the chart .� We have to accommodate the waist and then the top would be huge requiring major alterations or remake. The gown or dress is�NOT custom made to your measurements and will require alterations to fit your body type. The charts on the site are the measurements of the dress and give little if any excess. Have a seamstress measure you with a tape measure pulled smoothly over the body. Not tightly and not too loose. 1. The Bust should be measured around the fullest part from the front to the back�across the bra ( OVER THE BRA)� not under the bra or on the rib cage !�� Your bra size is not the same as�your�bust measurements.� 36C is not the same as your bust measurement. 2. The Natural Waist� needs to be measured�about 2 inches�above your navel .� (Its higher then you think.) Or the smallest part of the midriff. If you are not sure where to measure, bend to your side and put your fingers where the bend is and that should be your natural waist. Measure there.� Do not hold your stomach in as this will make a skin tight fit. Do not measure where your pants are worn as this will throw the size off. Put the tape around the waist area smoothly right on the skin and do not give any slack or have a finger in between tape and body. It's best to have someone else and preferably a professional seamstress do this for you. It's probably the most important measurement and needs to be 100% accurate to obtain the correct size. Not everyone will fit the chart perfectly so we need these numbers to get as close as possible to the size needed. For plus sizes measure around the fullest part of the stomach also and give us 2 measurements. Only in the case of a straight skirt, slim-a-line or when the hip is several sizes larger than the other measurements will a hip measurement be necessary to determine size. It's mainly used as a reference guide to the size but we do need it. Measure as close to the skin as possible as clothing creates some bulk and can add to the size. �See picture below for correct areas to measure.